Peter Carl Fabergé original name Carl Gustavovich Fabergé [1846 - 1920] was a Russian jeweller, best known for the famous Fabergé eggs, made in the style of genuine Easter eggs, but using precious metals and gemstones rather than more mundane materials, each egg is about 5 inches tall and depicts a different event or theme in Russia's history. 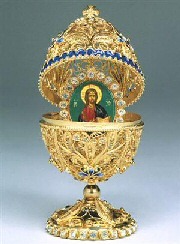 He was commissioned to create the first egg for the twentieth wedding anniversary of Tsar Alexander III and his wife Maria Feodorovna, of Russia, in 1885. Every subsequent Easter, another egg was made for Maria as a gift from her husband. After the passing of Alexander III, his son took up the tradition presenting his wife and his mother with their own custom Fabergé egg every Easter. In all, 50 eggs were commissioned; to this day eight are still missing. 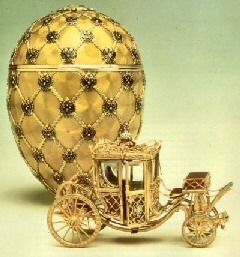 This is the Coronation Egg, which features the coach that Empress Alexandra rode into Moscow in 1897.